Azealia Banks joined Nick Cannon’s Wild N Out taping in Atlanta, Georgia and it’s safe to say these two will never work together again. The 27 year old Pan-African bisexual rapper who spews gay slurs and loves herself a dorky White guy allegedly spurred hate speech at both the Black and gay guests at the Wild N Out taping. 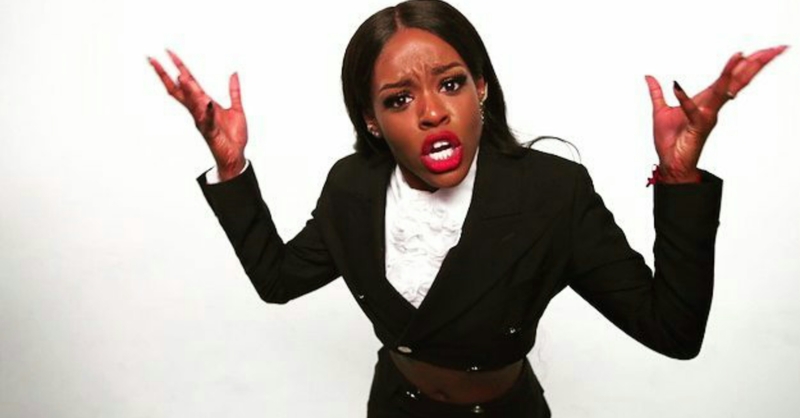 Azealia says the Black male comedians on the show, whom she calls “ugly”, “colorist”, “disgustingly basic” “ward of the state clowns” made a bunch of dark-skinned jokes aimed at her. Anyone who watches Wild N Out knows the cast of comedians act out scenarios in a roast-style format. The aim of the game is to make the audience laugh by clowning each other. Nothing is off limits. Even host Nick Cannon’s failed marriage and stunted rap career become part of the routine lineup. Apparently, Azealia didn’t get the joke. Nick responded saying “we are praying for you, Queen”, and Azealia quipped “Pray for your immune system Nick. Don’t pray for me”. According to Nick and a few other special guests, their story of that event sounds a lot different than Azealia’s, but they all agree Azealia brought her bad experience on herself. Hollywood Unlocked blogger Jason Lee, who was in attendance during taping, said Azealia participated in the roasting, but went too far, dropping the gay slur that rhymes with “maggot” while several LGBTQIA people were present, forcing Nick and the producers to stop filming and change the direction of the show. Comedian Emmanuel Hudson said no one targeted Azealia. Her clapback jokes were lame and when no one laughed at her jokes, she cried, said Emmanuel. She then left the stage, and only came back for her performance and didn’t say a single word to the other guests, forcing producers to switch up the show. Nothing more, nothing less! Literally there were two jokes made about her and they weren’t even bad. It was a cardi b reference and she was called ugly! That’s it! She tried to joke back it didn’t work and the producers stopped the game cuz they knew she was headed for the deep fry! She left after the first game, came back & didn’t say a single word till her performance! AFTER THE SHOW! she performed a song but the moment was ruined so WE AS THE CAST STARTED PRETENDING TO BE MODELS AS SHE WAS PERFORMING AND SAVED HER FROM FURTHER EMBARRASSMENT! The end! She wasn’t ambushed or tricked, she was just bitter and a weak special guest!